If your needs and budget are more modest, consider the StudioLive 16.0.2 rather than a StudioLive AI-series mixer. The 16.0.2 doesn’t have the power of Active Integration but it’s plenty powerful enough for many applications, and it’s inexpensive, compact, lightweight, and ultra-portable. The StudioLive 16.0.2 also has a very cool feature that the larger StudioLive AI mixers don't offer: MIDI control over main output level, effects levels and routing, and Scene change. It has MIDI I/O on standard 5-pin DIN jacks—perfect for remote control from a MIDI footpedal or other controller—and it can serve as a standard MIDI interface for your computer. The StudioLive 16.0.2 also can send and receive MIDI over FireWire, so you can automate its MIDI features from a DAW. Our first-generation StudioLive™ 24.4.2 and 16.4.2 changed the game, offering amazing performance and ease of use for a great price. So we packed the same audio quality, performance, and seamlessly integrated software (including remote control) into a smaller, even more affordable package: the StudioLive 16.0.2. True, the little fellow doesn't have the Active Integration™ muscle of the mighty StudioLive AI-series mixers but it's far more powerful than its size might lead you to believe. Furthermore, it's amazingly lightweight and offers MIDI control—unique in the StudioLive line. It's easy to love this portable powerhouse. But don't let its size fool you; the 16.0.2 is jam-packed with features and processing power, employs the same workflow and easy-to-use mixing-surface design as the bigger StudioLive boards, and sounds every bit as good, with the same high-definition, wide-dynamic-range, digital converters. More than a mixer: an integrated system. The StudioLive™ 16.0.2 integrates a 16x16 FireWire interface and comes with Capture™, Studio One Artist™ recording and production software, and Virtual StudioLive (VSL) bidirectional control software. VSL, in turn, incorporates Smaart Measurement Technology™, which makes it easy to analyze and fine-tune your main mix. Moreover, you can control virtually the entire mixer from an iPad® using PreSonus StudioLive Remote, and you can control the aux (monitor) mixes from an iPhone® or iPod touch® using PreSonus QMix™. Both are free downloads from the Apple App Store. Because of our powerful, integrated, free software, StudioLive digital mixers can do far more than their competition. Virtual StudioLive: The magic of computer control. Written exclusively for StudioLive mixers, Virtual StudioLive (VSL) provides a complete visual representation of the mixer, allowing you to control the features with a mouse, trackpad, or trackball on a FireWire-equipped Mac® or PC. Add third-party VPN software, and you can even control StudioLive mixers over the Internet—ideal for contractors. To get a competing mixer with computer control even close to this complete, you'd have to pay several times as much. Learn more about Virtual StudioLive. You’re mixing a live show with an old-skool mixer—make that any mixer other than StudioLive—and you need to check the sound underneath the balcony—or in the balcony, for that matter. Or you’re sound-checking and want to hear the stage monitors for yourself. If you can’t leave the mixing station, you have to rely on someone else’s ears. If you don’t have a reliable crew, you don’t have a chance. You can say goodbye to that problem if you use a 16.0.2 and an Apple iPad! With StudioLive Remote for iPad—available free from the Apple App Store—you have complete, real-time, wireless remote control over Virtual StudioLive, which in turn offers real-time control over the StudioLive mixer. As long as you have a wireless connection between your iPad and computer (and are connected via FireWire to the 16.0.2), you are in control of the console. Learn more about StudioLive Remote. Yet even better: control of monitor mixes from iPhones and iPod touches! We've given you a lot of sonic control with the StudioLive, Virtual StudioLive, and StudioLive Remote. It's only fair that we help you give the band control of their sound, too. With PreSonus' free QMix™, each band member can control their own StudioLive aux (monitor) mix from an iPhone® or iPod® touch. QMix lets you adjust a single aux mix per iPhone. Select inputs and levels for your custom monitor mix, and then use the Wheel of Me to get, well… “more me”… quickly during performances. You can even set permissions to ensure that the bass player, always the practical joker, can't mess with the hot-tempered lead singer's monitor mix. Otherwise, that bass player is going to get in trouble someday. We're just sayin'…. Recording made easy with Capture™. 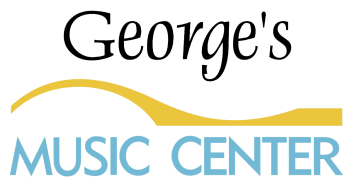 Check out our competition, and you’ll discover that their “recording” capabilities amount to stereo-only or just four channels — or require expensive add-ons. With the StudioLive 16.0.2, if you have a laptop, you have a multitrack digital recorder instantly ready to capture your gig, church service, or presentation. Just two mouse clicks engages Capture recording software. When you install it on your laptop, it automatically “maps” to the outputs of the 16.0.2 to automatically record all 16 input channels. Studio One® Artist — A serious digital audio workstation. Once you’re recorded studio tracks or a live multi-track performance, it’s time to finish it with effects and a good mix (not to mention editing out that huge burst of feedback during the third song). Studio One is a groundbreaking music-creation and -production application for Mac OS X and Windows XP/Vista/7 that makes audio recording and MIDI sequencing ridiculously simple right out of the box. Studio One changes the rules of the game with fresh code, innovative drag-and-drop features, advanced MIDI mapping, auto-configuration with your StudioLive 16.0.2, insanely good audio quality, unlimited tracks and plug-ins per track, and a powerful, inventive Start page. Studio One Artist also comes with a Native Effects™ 32-bit effects library, complete with dynamics processors, reverbs, modulation effects, amp simulators, and more. And with Studio One's free Nimbit® extension, you can immediately start selling your music. 130 quality signal processors at your fingertips. The 16.0.2's Fat Channel is well stocked with compressors, limiters, gates, phase reverse, high-pass filters, and 3-band semi-parametric EQ. Two stereo, 32-bit floating-point effects processors deliver delay and reverb effects. Not just effects. Effects you’d expect from a $600 standalone processor. You get two programmable, 32-bit floating point, stereo DSP effects engines, loaded with 50 reverb, delay, and time-based effects presets that you can really use. The reverbs are so rich and detailed that you feel like you’re there. Delays are precise. Slap echo sounds like old-skool tape effects. All 50 effects have easy-to-use parameter adjustment, tap tempo, and store and recall selection for the ultimate in creative flexibility. The StudioLive 16.0.2 also sports a stereo 31-band graphic equalizer on the main outputs, so you can compensate for room acoustics and speaker response. Whether StudioLive’s dozens of signal processors and 50 DSP effect presets were on gigundo channel strips, in a whopping rack of outboard gear, or neatly condensed into our Fat Channel, they have a lot of settings to remember and reset at every performance. That’s where the power of digital comes in: StudioLive never forgets. Our first compact mixer with MIDI control from a footpedal. Moreover, a glance at the rear panel reveals that "Junior" offers something the two bigger boards don't: MIDI In and Out. You can recall Scenes from a DAW using MIDI Program Changes, control the main output volume and effects level, and even mute effects between songs—all thanks to the magic of MIDI control. What was then is now: complete store and recall. Two factors work against getting that Perfect Mix with an analog mixer. First, the Perfect Mix can be hard to reproduce a week, day, or hour after you perfect it. And second, a good mix should be dynamic: levels, effects, and EQ should be tailored to each song or segment of the show, service, or presentation. StudioLive solves this problem by letting you save all of your digital settings for quick setup and recall. All PreSonus mixers are special order, please allow 5-7 days. Although the three StudioLive AI-series mixers are virtually identical in many respects, there are some other noteworthy differences, as shown in the table below. Bottom line: If you don’t need 32 channels and 14 auxes, can live without Quick Scenes and Mute Groups on your mixing surface, and would like to have a smaller footprint (the 16.4.2AI is rack-mountable and comes with rack ears)—not to mention spend less money—the StudioLive 24.4.2AI and 16.4.2AI are great choices. 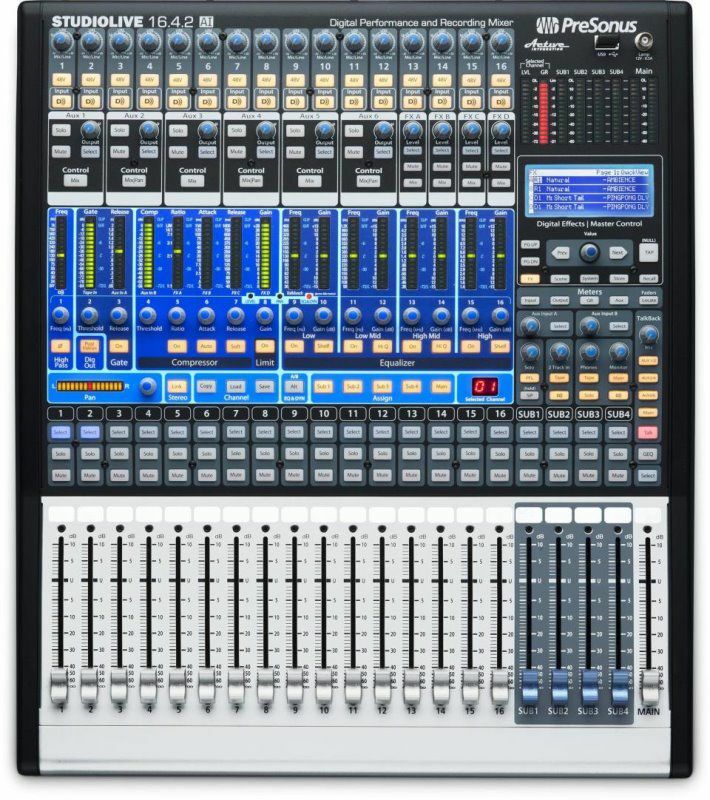 With a powerful user interface, unrivaled sound quality, amazing DSP performance, direct Wi-Fi and LAN communication, fast and intuitive workflow, onboard FireWire s800 interface, and tightly integrated software suite for Mac®, Windows®, and iOS®, StudioLive™ AI-series digital mixers create a streamlined working environment for both live and studio use. StudioLive AI-series mixers start with all the strengths that made StudioLive mixers famous. Then they push the technology to the next level with Active Integration™ (AI), a complete, networked, tightly integrated hardware/software ecosystem in which every touch point in the system communicates to enhance the user experience and solve practical problems in ways not previously possible. ​Active Integration products combine powerful 32-bit floating-point DSP, wireless and wired networking, USB 2.0 connectivity, and proprietary software to solve real-world live-sound and studio problems. PreSonus leads the industry in hardware/software integration, and Active Integration takes this concept to a new level, offering high-end capabilities that have never been available before. Current Active Integration products employ cutting-edge OMAP™ L138 processors — a whole computer on a chip. These 32-bit, 96 kHz multi-stream CPUs operate at 350 MHz and feature an operating system, 100 Mb Ethernet communications, USB 2.0 and 1.1, and lavish amounts of high-speed RAM. 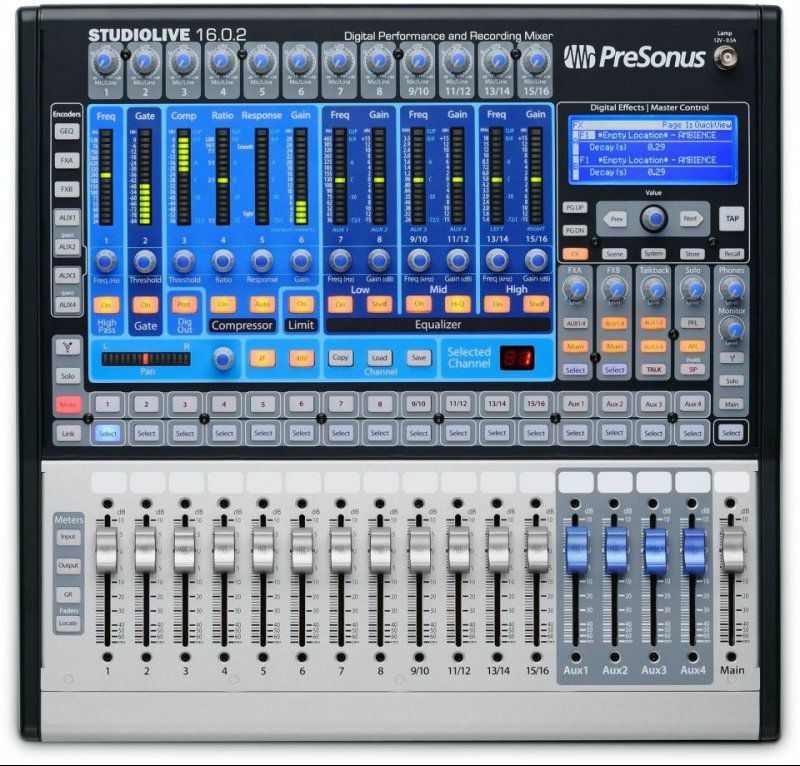 In PreSonus StudioLive™ AI-series digital mixers, Active Integration technology includes powerful Wi-Fi remote control over a variety of features, using free Mac®, Windows®, and iPad® software. In addition, Active Integration enables standard Ethernet communications and optional Dante and AVB networking, making possible extremely flexible, powerful, networked systems. Thanks to Active Integration, the StudioLive AI-series mixers have 64 times the processing power and an incredible 10,000 times more RAM than the previous top-of-the-line StudioLive 24.4.2. This makes possible an extended feature set, including twice as many internal effects buses, and the ability to create two complete sets of EQ and dynamics settings for a channel and then make quick A/B comparisons at the touch of a button—all built on the same 64-bit architecture that makes Studio One sound so good. 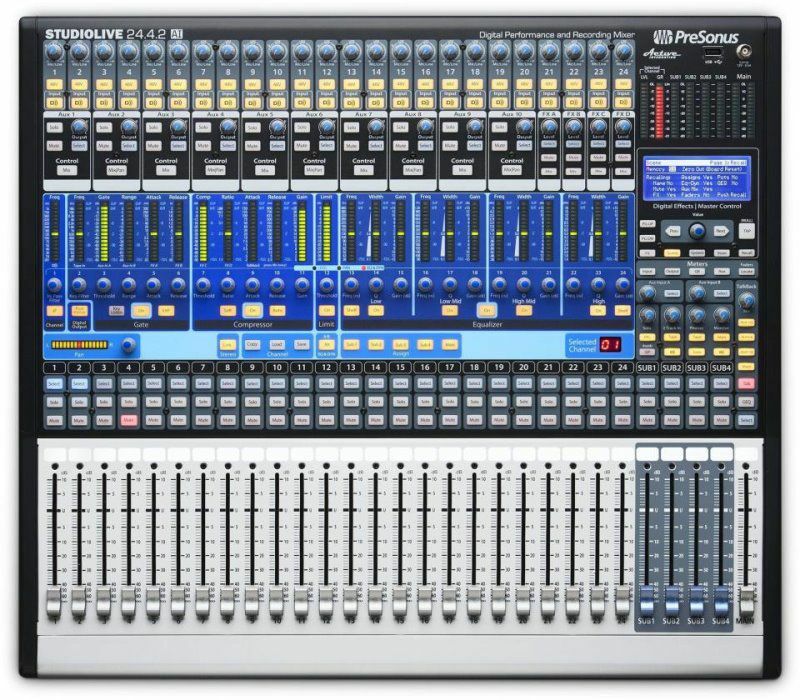 With Active Integration, new features and enhancements can be added in future firmware and software updates—and PreSonus has earned a reputation for regularly supplying such updates in its digital products. But Active Integration doesn’t stop with hardware. The new StudioLive AI software suite has also been redesigned to take advantage of the new networking features. All PreSonus mixers are a special order, please allow 5-7 days.